Wood Panels: What's to Love? 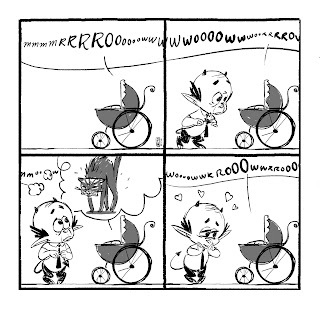 I'm happy to present another comic featuring that little devil. He'll need a name at some point, but, that's not what this blog is about, so let's get to it. Pretty simple story/joke here, and I think it is clear and understandable. 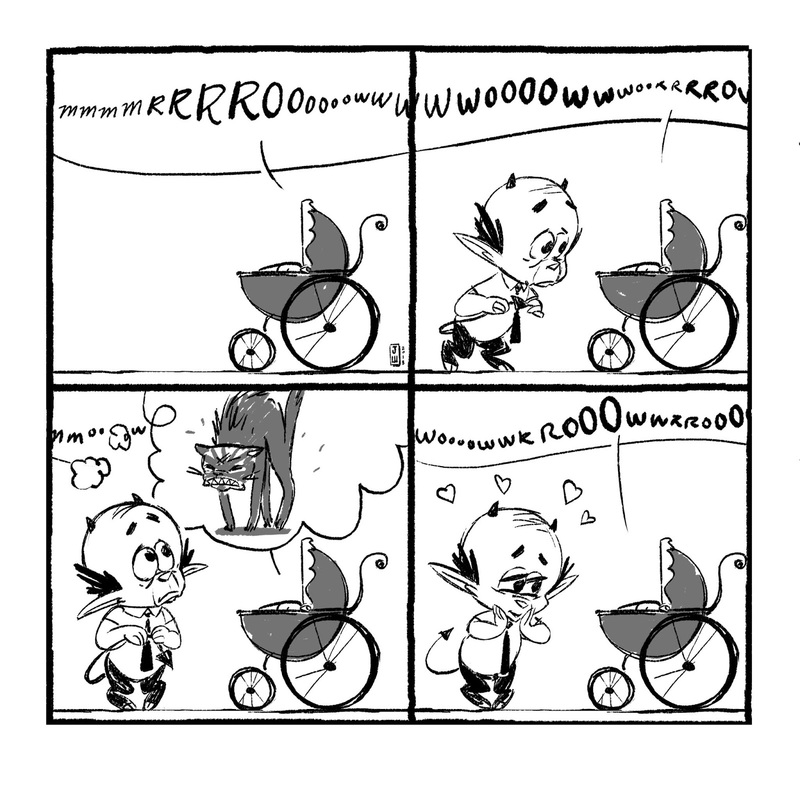 The once thing I'm not sure is entirely clear is that I wanted to suggest the baby sounds like a fierce cat, not that whatever in the carriage is a cat, and I think the line coming from the carriage suggests the latter, even though that line is present in the other panels. It needed the line, but still, I think that little line is confusing. Yes, I did hand ink the letters, 'cause I just wanted to get it done and up here. I tried to make them look nice. Hope you like 'em, Mr. Ghost. Yeah, I re-used the carriage (CHEATER!!! ), but I did the shading differently for each panel, which helps it look a bit different. Again, I like the poses on the devil, and his facial expressions. I really like the grey shading and flying fur lines on the cat, which help to accentuate it's anger. I think the joke is cute, but also a bit unexpected. REALLY nice symmetrical format and I don't mind the "cheating" of re-using the carriage (I didn't even notice it). The little devil is PERFECT in every frame. Very emotive. The cat is also very clearly furious. And... I really like your lettering here. SO good (a font could never be as fluid or expressive). What I love the most is the way the word balloon stretches from panel to panel and then gets broken up and then continues again. (I kinda wish it would connect between frames 3 and 4). Very cool! A possible name for the devil? How about L'il Lucifer? Or...Beelze Bub? I noticed I could have moved the carriage over a bit left in the 3rd panel. That would give more space for the cat/thought bubble and might give more space for the baby's meweling... ie, it would have made it all a little less crowded. Is that like a Sponge Bob joke? I can see I need to do a new comic or drawing to move this discussion on to a better place. And here I thought I was safe drawing comics that occur in Hell. Geez, was my joke THAT bad? Hey, wait a minute... your comics occur in hell? Are there babies in hell?!!! Dang, I knew I shouldn't have said anything. Then again, nobody but us is reading this so... yes. Hell. Babies are in hell, everybody's in hell. Why? Well, life is hell, so... maybe there is new life in hell. Another way to look at is this world we think we live in right now could be hell, and maybe we just don't see the fire blazing everywhere or the devils, but maybe they're there just the same. And maybe the devils are having difficulties just like everybody else has. Just 'cause they are the jailors with the keys doesn't mean life is all sweetness and light for them. No way. Why?! Well, 'cause they're in hell of course! ... maybe by drawing more comics? Maybe you never have to explain anything. Just like how Sponge Bob lives underwater but can fall off cliffs or start a fire or drink water from a glass. But you should DEFINITELY do more comics!!! !